How much extra money did you earn this week? How much did you save? 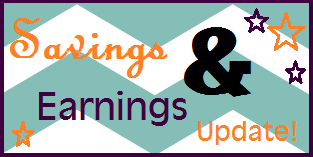 Here's my weekly update of money/gift cards earned, cash saved by using coupons (not including sales/clearance), and freebies received. It's fun to see your savings/earnings amounts all added up. It clearly shows that it's time well spent when you use coupons and make little bits of money here and there. This update includes the week of 2/2 - 2/8.